PHCPI’s Conceptual Framework was developed to describe the critical components of a strong primary health care system and serves as the foundation of the initiative’s activities. Intended to guide what should be measured to inform and drive efforts to improve PHC, the Conceptual Framework includes the key system-level characteristics, inputs, service delivery processes, and goals of an effective PHC system. Recognizing that no primary health care system exists in a vacuum, the Framework also highlights the broader socioeconomic, political, and cultural context in which the broader health system operates. Similar to other input-process-output-outcome logic models, the Conceptual Framework flows from left to right and illustrates the directionality of system components, as well as the relationships between domains. Download a description of the framework’s domains here. The PHCPI Conceptual Framework was developed through a process of extensive literature review and consultations with leading global experts, advocates, and policymakers. The Framework also builds on existing frameworks for health systems performance used in low- and middle-income countries, with over 40 existing frameworks reviewed during its development. 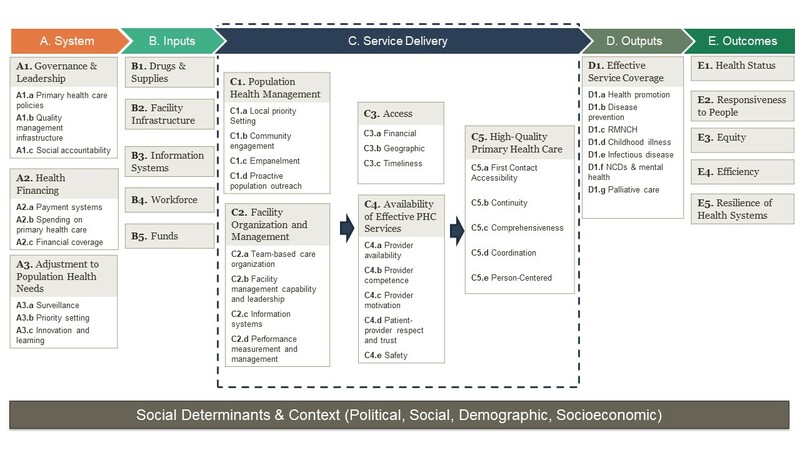 The review revealed that most of these health systems frameworks prioritize inputs (such as human resources, supplies, and facilities), outputs, and outcomes, with less attention to the service delivery processes that influence the interactions between providers, people, and communities and the quality of primary health care services. A focus on service delivery processes sets the PHCPI Conceptual Framework apart from previous frameworks. The following areas of the Framework will be the focus of efforts to develop practical new ways for countries to measure primary health care service delivery. Access - Do patients have affordable, timely access to primary health care that is geographically convenient? Availability of effective primary health care services - Are primary health care facilities functioning, with workers who are motivated, competent, and equipped to provide quality services? People-centered care - Does the system offer the well-established key functions of primary health care including, first contact accessibility (from the user perspective), coordination, comprehensiveness, continuity, and safety? Organization and Management - Does the system appropriately organize and manage important elements of primary health care delivery, including team-based care, supportive supervision, population health management, and use of information systems that aid in monitoring services and continually improve quality? This Conceptual Framework defines what is important to measure, and it also helps us to identify where important data is missing. PHCPI will address these knowledge gaps by partnering with countries, donors and development partners to develop new indicators and data collection tools that can be useful for countries working to improve the performance of their primary health care system. The selection of Core Indicators and the Vital Signs Profile Indicators was informed by the PHCPI Conceptual Framework. Download our 2017 article in The Milbank Quarterly for a detailed description of how the PHCPI Conceptual Framework was developed. Download our 2016 paper in JGIM on the PHCPI methodology here and an early methodology note from 2015 here.